Here is another yummy recipe for zucchini, it’s that time of year and the zucchini is plentiful. This makes a delicious side dish for any evening meal. Hope you enjoy it as much as we do. Pour the oil in a skillet so that it is half an inch deep and turn the heat to medium. While waiting for the oil to heat up, combine the zucchini, onion, and eggs in a large bowl. Stir the mixture to combine. It may get a little frothy, but that’s ok.
To finish the batter, add the dry ingredients to the zucchini mixture and fold it all together. Once your oil is hot (dip a spoon with some batter on it into the oil to test, if the oil starts bubbling in contact with the batter, it’s ready) you can drop the batter a tablespoon at a time into the oil, frying for 2-3 minutes per side. 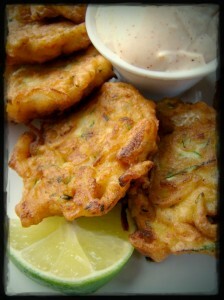 If you want a more substantial fritter, form the batter into loose ‘patties’ and fry in oil 3-4 minutes per side. When the centers are firm, remove them from the oil and allow them to drain on a plate lined with a paper towel. To make the dip, simply combine the prepared mayo, lime juice, and chili powder in a small mixing bowl and stir it all up.